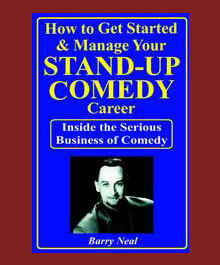 Barry Neal has been a professional stand-up comedian for over 20 years. In addition to doing the booking for numerous comedy clubs, coffee houses and universities, he maintains a rigorous schedule of headline appearances at comedy clubs and corporate events around the country and also conducts a comedy workshop that includes 5 weeks of class and culminates in a live performance at a top comedy club in Los Angeles. Over the years, Barry has coached hundreds of local comics, actors and writers, many of whom have become headliners and appeared on numerous cable and television shows including those hosted by Conan O'Brien, Jay Leno and David Letterman. 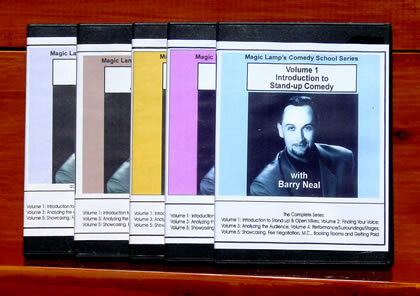 Because so many people interested in stand-up comedy don't live in the Los Angeles area and can't attend the comedy workshop in person, Barry has put the main portions of his classes into this five-volume DVD course, and is now also available as Paperback and also as an eBook. Volume I: "INTRODUCTION TO STAND-UP"
Volume II: "FINDING YOUR VOICE"
Volume III: "ANALYZING THE AUDIENCE"
Volume IV: "PERFORMANCE and SURROUNDINGS"
Volume V: "SHOWCASING, BOOKING ROOMS and GETTING PAID"